Although you can receive some reports within MailChimp, if you want to study your email campaigns in depth, you need a service like Google Analytics. The good news is that it is easy to integrate the two services. Like this, you’ll be able to start tracking subscribers’ journeys as they become customers and use Google Analytics IDs to track visits to campaign pages and your hosted campaign archive. 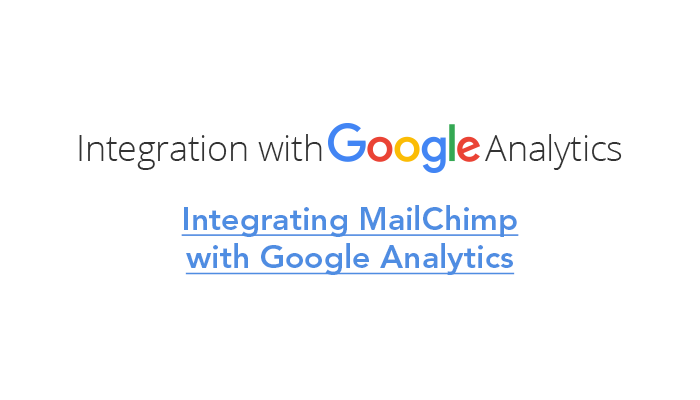 To integrate MailChimp with Google Analytics, you need to have a Google Analytics account set up already. You also need to be at least an Admin-level user on MailChimp. The first thing to do after connecting your accounts is link your first campaign. The setup is mostly straightforward, but the “Tracking” section does require some explanation. When you check the box next to “Google Analytics link tracking,” MailChimp will automatically generate a title for your campaign. This title will appear both in your Google Analytics account and in your tracking URLs. If you want to change the default title, you must be sure to avoid special characters that cannot appear in URLs. One invaluable feature of MailChimp is the ability to create automations. This is something else you can track in Google Analytics. 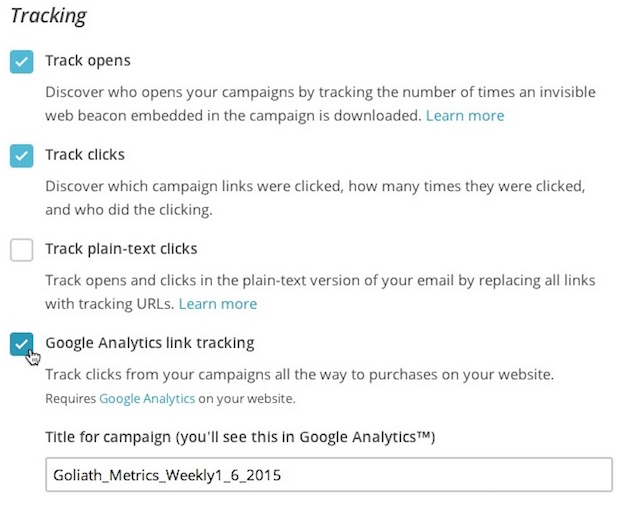 Using an automation you’ve already created, head to “Setup” and find “Tracking.” Like you did for your campaigns, check the box next to “Google Analytics link tracking.” The campaign title will appear in your Google Analytics dashboard along with the date. If you would rather that each of the emails in the automation have a different title, an extra step is necessary. Head to “Emails” and choose an email. When you reach “Setup” in the “Email Designer,” enter a new title in the “Google Analytics title for email” box. Repeat this step for every email you want to have a distinct title. Google Analytics also allows you to track A/B testing for campaigns. The first step is exactly the same as for tracking automation — simply enable “Google Analytics link tracking” in the “Setup” stage. There is one more thing to note about A/B testing campaigns: when you test content, each combination in the campaign will have a different web ID. You need to record which combination corresponds to which ID before you launch the campaign. This will make it clear what the Google Analytics data relates to. You can find the web IDs when you reach the “Design” stage in “Content Builder.” In the “Preview and Test” option in the menu, select “Enter Preview Mode.” Look for the unsubscribe link (it is usually in the footer) and right click or control click to copy the link address. Save the link in a file. The value directly after “c=“ will refer to the data in Google Analytics. 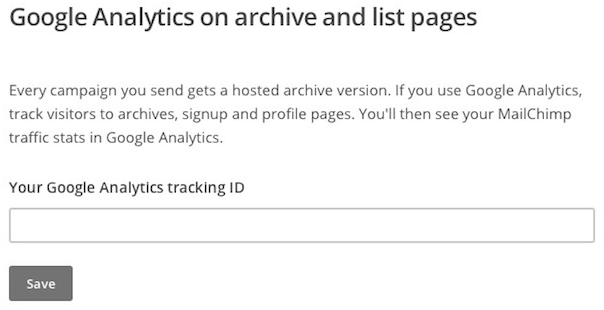 A final task to complete in MailChimp is to set up tracking of campaign pages and hosted campaign archive. Under “Lists,” find “Settings” and choose “Google Analytics on archive pages.” Paste your Google Analytics tracking ID and hit “Save.” You’ll be able to find information about this traffic in your Google Analytics reports under “Traffic Sources.” MailChimp is fine for gaining basic data about opens, clicks, and subscribers, but by integrating MailChimp with Google Analytics, you’ll receive in-depth information about every aspect of your campaign. Only with this can you optimize the performance of your campaigns.